Once a contract is signed, Aircontact‘s real job starts. Regardless of whether the assignment is a cargo or passenger flight, there are numerous details to be attended to before the aircraft is airborne. Aircontact will coordinate all these details, to minimize trouble for the client and make sure that the flights are completed to the client’s satisfaction. Aircontact does not stop working until the aircraft is safely at its final destination. Aircontact will always prepare a flight brief before each flight, outlining all the essential information agreed for the flight, such as handling details, catering, schedule, contact details etc. During the operation, Aircontact‘s OCC will continually monitor and pass on movement reports to the client and other requested parties, so all involved are kept up to date with regard to the status of the flight and its progress. It is the airlines’ responsibility to ensure that all certificates, insurance etc. are in accordance with the regulations, and it is the job of the national civil aviation authority to check these matters. However, we also carry out our own reference checking. Aircontact acts as broker for many different kinds of aircraft worldwide and our clients are kept constantly informed as to which companies are involved. 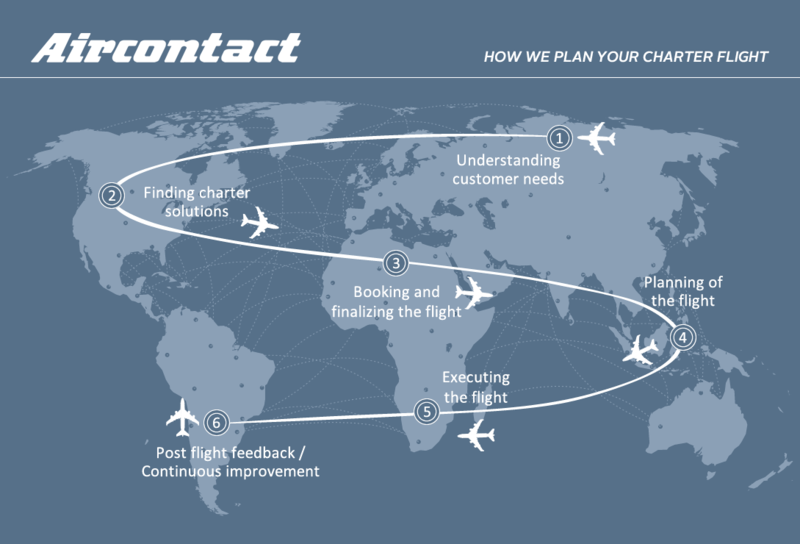 Aircontact is part of the Aircontact Group, which is actively involved in various sectors of the travel industry and has an annual turnover of more than 500 million Euro. With an average gross turnover of more than 50 million Euro, Aircontact has a solid capital base with good annual results and our performance is consistently at a high level. All payments for charter flights go to Aircontact, which takes care of onward payment to the airlines. Your financial exposure is thus minimized since you avoid paying large sums to unfamiliar airlines with foreign bank accounts. At Aircontact, we know our suppliers well and better understand the risks. As a client, you can avoid such uncertainty and rest assured that your payment has gone to a secure Norwegian company.